New York City’s Boutique Solution for Staffing and Recruiting. Need advice? In a pinch for last minute staff? Contact our recruiting team with over 20 years of proven placement success specifically in the NYC job market. Reach us 24/7 at (212) 244-2777 or email info@staffingnewyorkcity.com. Millennium Personnel Corp. specializes in finding the right administrative talent for your employment needs. For over 20 years in New York City, our independent, women owned boutique staffing service has specialized in talent acquisition and recruiting top-tier candidates. We have an active network of administrative personnel available at all times. From temporary staff, to temp-to-perm placements, to direct hires, our recruiting agency offers staffing solutions to companies across all market sectors, specialties and industries to fulfill all your hiring needs. Whether you have a specific admin job listing, or just need advice regarding your possible support staff needs, call us at (212) 244-2777. 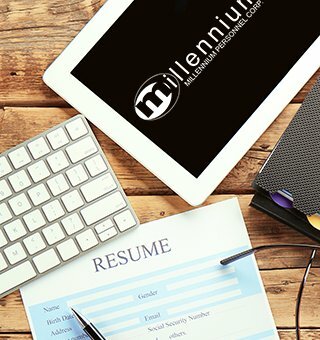 Whether you are a recent college grad or a seasoned Executive Assistant, at Millennium Personnel Corp., our employment agency prepares individualized job search assistance and staffing strategies just for you. And there is NEVER a fee to the job seeker related to job hiring! Our professional New York City recruiters have personnel contacts within the best companies. We can help get you a temporary assignment, temp-to-perm placement, a long-term job, or even resume assessment and resume writing if you are having trouble getting job placements. To learn if we are the right staffing resource for you, contact us at (212) 244-2777 or submit your resume to info@staffingnewyorkcity.com. Are you tired of not landing the right job interviews? Does your resume look tired, old and boring? Do you just need to update your existing CV? Or just need a digitally friendly resume that highlights key words and industry phrases? No worries! Millennium Personnel Corp. can help! Resume writing services, as well as cover letters, thank you letters, and reference lists are our specialty – not only for the New York City resume market, but for job seekers all across the U.S. We specialize in resume creation and resume revision for all industries and all levels from entry-level resumes to executive resumes. Call us today if you need advice on your resume portfolio. (212) 244-2777.